Creator Names Chicago Daily News, Inc., photographer. Title [Colonel Horatio B. Hackett, 124th Field Artillery, U. S. Army, Camp standing between two trains] [graphic]. Physical description 1 negative : b&w, glass ; 5 x 7 in. Access and usage restrictions Restriction: Original negatives are fragile and not available to researchers. Please consult the on-line image instead. 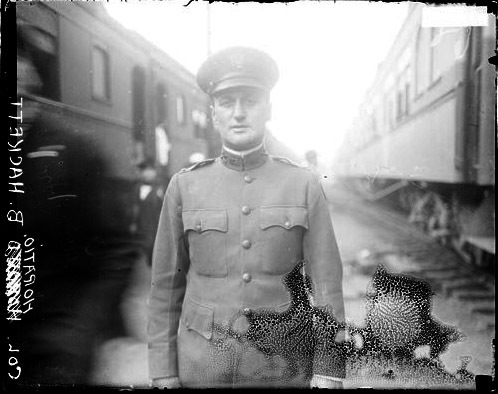 Collection summary Informal portrait of Colonel Horatio B. Hackett of the 124th Field Artillery, U. S. Army, Camp Logan, Houston, Texas standing between two trains at a train station in Chicago, Illinois. Terms Governing Use and Reproduction The online images are supplied for reference purposes only. All other uses are restricted. To acquire copies, including improved copies, or permission for use, please contact Chicago History Museum, Rights and Reproductions Department, 1601 N. Clark Street, Chicago, IL 60614. United States. Army. Field Artillery Regiment, 124th. Geographic coverage Chicago (Ill.) 1910-1919.